Jungle Island (it used to be called Parrot Jungle Island) is one of those attractions in South Florida that has been around so long that most South Florida residents have been there. It’s like the Statue of Liberty. Eventually, most residents of New York will visit in their lifetime. 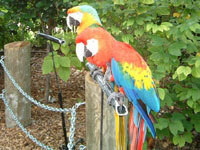 Jungle Island has lived two lives during its existence; the original Parrot Jungle established in 1911 in Dade County, and the new Jungle Island, which opened in June 2003, located on Watson Island in the heart of Miami. Franz Scherr, an Austrian Immigrant, founded the first Parrot Jungle. After Scherr’s career was cut short during the Depression, he relocated to Florida and opened a feed store in Homestead, a city in south Dade County. Scherr kept some parrots around the store and eventually found these birds easy to train. These entertaining birds quickly became a local attraction. This was the beginning of Jungle Island. The establishment was run by the Scherr Family until 1988 and was then sold, marking the beginning of the new Jungle Island, as we know it today. 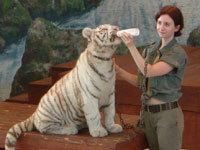 I must admit that I miss the old Parrot Jungle. It had unbelievable landscaping and majestic trees. The animal shows were unique, exciting and fun. It was disappointing that the old facility was not able to expand upon their existing grounds. It seems that moving was an economical choice for the organization. It made sense to move to downtown Miami where many tourists pass through everyday. Nevertheless, it is disappointing to know that so many people missed the experience of a real South Florida jewel that was the original Parrot Jungle. There’s no time for crying, though. It’s time to move on with the new Jungle Island. The establishment opened on June 28, 2003, with a total project cost of $47 million. The park occupies 18.6 acres on Watson Island. Among the attractions at Jungle Island are the Manu Encounter, Parrot Bowl, Serpentarium, Jungle Theater, Everglades Habitat, a children’s’ area, and plenty of shopping. After spending a day at the jungle, I realized that the only show I found truly satisfying was the Serpentarium. 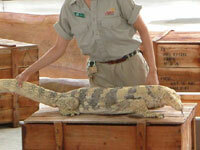 The women presenting the show were energetic and the animals were intriguing. The children in the crowd seemed to be having a marvelous time. They got a chance to participate in different parts of the show. There were about 10 kids who had the chance to hold a 15-foot Python snake. I appreciated the amount of unsolicited cheering and clapping there was amongst the attendees. There were two additional main shows, Jungle Theater and the Parrot Bowl, which were both interesting and informative, but not nearly as captivating as the Serpentarium show. 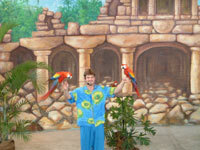 I don’t want to live in the past, but I have to bring up the Parrot Bowl show at the original Parrot Jungle. 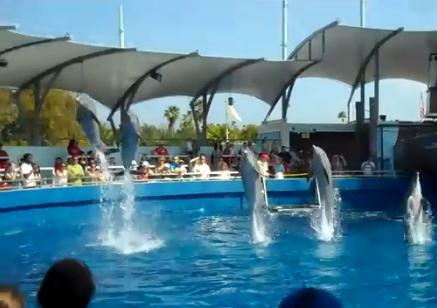 The animals displayed incredible behaviors like roller skating, pulling up flags, and riding bicycles, just to name a few. The kids would go wild. Now, in the new show, for the most part, the birds just fly around, and a few talk for you. Unfortunately, this was not nearly as fun as the old show. Fortunately, though, if you never saw the old show, you will probably be pleased with the new one. The food on the premises is excellent, but very expensive. You can get a pleasurable full hot meal, including meat, starch, and vegetable. Lunch for 2 will run from $20 – $30, for a sandwich, drink and chips only. 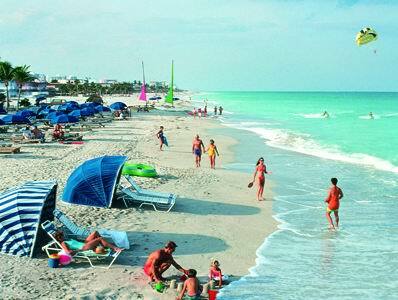 For some, it might be a good idea to bring your own lunch or venture out to South Beach, a few miles away. Other attractions in the area include Miami Seaquarium, Vizcaya, South Beach, Bayside Shopping Mall, Police Museum, and the Museum of Miami, Swimming with the Dolphin in Miami, which I highly recommend. Overall, if you have plenty of time in the Miami area, or if you have kids and need to entertain them, I would recommend a stop at Jungle Island. Hopefully, over time, when the foliage matures and the shows get more sophisticated, this will be an awesome place to visit for all.